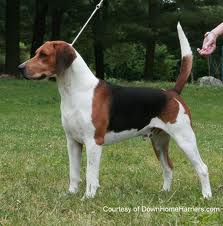 Unlike most breeds, the Harrier is believed to be bred down from the English Foxhound by selective breeding. Except for size, the Harrier looks to be just a smaller sized Foxhound. They are also thought to be "cousins" to the Talbot and Old Southern Hounds, and may have contributed to the Small Game Anglo-French Hound. The name Harrier means hound in Norman-Saxon, and because of this it is thought that the Harrier traveled to England alongside the Normans. Developed primarily for hunting hare, they have also been used in fox hunting. The first pack of Harriers in England was called the Penistone, established by Sir Elias de Midhope in 1260 it held together for at least five centuries. Hunting was very popular throughout the British Isles, most likely because the pack could be followed on foot. Packs contained a hundred plus dogs, most of them scratch packs. Scratch packs were made up of Harriers owned by various people; by doing this the common, or poor people, were able to participate. During the 17th to 18th century they were owned mostly by the poor people, while the wealthy class owned the Foxhounds. The breeds was then adapted to hunting fox in front of a group of horse-mounted riders (though most packs were able to hunt both fox and hare). Harriers have been in the United States since Colonial times. General George S. Patton was Master of the Cobbler Harriers (a pack) from 1936-1938. The last pack of Harriers was in the late 1960s, before everyone got into foxhounds and foxhunts. They were first admitted into the AKC Stud Book in 1885. The breed is still relatively rare in the US. In 1877 only two Harriers were shown in the first Westminster Kennel Club. Today, most are housepets, though some are being shown or obedience. Only a handful are still used in hare hunts, as they work game that are too fast for Beagles, very well. The Harrier is a friendly, outgoing dog that loves to pay. Their sweet-tempered, gentleness and affectionate nature make them excellent with children; they will put up with almost anything. Preferring not to be alone, they enjoy life in a pack with people, other dogs, or both. As a pack breed, they must be able to work closely with other hounds, hence why any dog aggressiveness will not be put up with. If raised with them from puppyhood, they should get along well with cats, and other small pets. Harriers love to go exploring, and their keen-nose will trail any scent it finds; be sure to keep them on leash or in an enclosed area. Though great watchdogs, barking at anything unusual, they do not make good guard dogs. They love everything, and everybody, and will let anyone into your home. Built for endurance, this persistent hound is lively and energetic, but not hyperactive; it is known for its prey to collapse from pure exhaustion when pursued by the Harrier. One of the best things about Harriers is that they can always make you laugh; they are complete clowns, always wanting to play (not only as puppies, but through their entire lives). They want to be part of the family, and will greet you with such joy when you leave for even 5 minutes, like they have not seen you in years. Because the breed was bred to work all day out in front, or away, from the hunters, they have to be able to think things out for themselves and to never give up. If you're looking for a breed that dwells on your attention and affection, then this is not a breed for you. Harriers are very independent, and will go and make their own entertainment, though they should not be unsupervised as they will get into mischief. Some like to bay usually in a low, deep voice. They have been known to hunt hare and fox, and even deer and wild boar. Harriers, in general, are one of the healthiest breeds of dog. The main reason for this is because of the rarity of the breed; there is not high demand for them. A short-haired breed, the Harrier is easy to groom and requires little to no care; brushing is recommended once a week. Ears should be checked on a regular basis. The Harrier is a very energetic breed; it needs a sufficient amount of exercise or it will become bored and destructive. They do tend to get overweight and lethargic if not exercised. They enjoy the outdoors, and are good companions for jogging, bicycling, hiking, camping, boating etc. If introduced to water as pups, they may enjoy swimming as well. Due to their breeding, they are inclined to following their noses and wandering off; they should not be left alone outside unless properly secured in a yard. Elderly or disabled people may have trouble keeping up with their energy level. Once they have been sufficiently exercised, inside the home they are generally very calm. Lying in your lap, playing quietly with the kids or their toys, they are really a wonderful dog. Not recommended as apartment dogs, the breed does best in a rural environment with a securely fenced-in yard. Lots of daily exercise would be needed if considering living in an apartment, or city. They are very social and people-oriented, if they are to be alone most of the day consider getting another dog to play with; a bored Harrier is a destructive Harrier. Because of their independence and stubborn nature, obedience is highly suggested to start at a very early age. They are very intelligent, and easy to train. Though not many are seen in obedience competitions, they are capable of doing it, though it requires a lot of time and energy on your part. They love agility (probably because of their awesome problem solving skills) and tracking, which they pick up easily. Also a great breed to show for beginner and experienced handlers alike, though it may be hard to find other Harriers to compete against. If you are looking for a breed that wants to constantly be with you, at your beck and call, then this is not a breed for you. Harriers love to be with you, but they do not depend on your for their entertainment. Because of this, they may get into trouble causing mischief to entertain themselves. They are not recommended for the first-time dog owner, as one of the biggest problems with the breed is wanting to be in charge. NILIF works great, they need to be shown consistent discipline and let know that you are in charge. This is a breed that adores food and may tend to try and counter surf. They are also very talkative and love to bay in a deep low voice. Some may also like to dig, either because they find it fun, but most are searching for critters underground, or out of pure boredom. All of these "traits" can be fixed with early training, they must be taught not to... no leeway or giving in, or they will never stop.